A SPASSO SUL PASSO ( A WALK ON THE MOUNTAIN PASS ) Passo San Boldo like you've never seen, heard and enjoyed! A day to discover the secrets of natural, historical and gastronomic Passo San Boldo. Knowing the history and life of a territory, its resources, its fragility and its strengths, promotes respect for the environment, animals, people…, because feeding the planet is not just to ensure food all its inhabitants, but also means "feed" the people with the knowledge and awareness of the fragile balance of nature that man is compromising to produce more and more. Feed the planet of knowledge because only through this awareness, will be possible a sustainable future. Genziana Restaurant offers along with naturalist guides of "Mazarol" an easy guided hike, during which the guides will observe and will show you the natural beauty of this corner of the Alpine foothills rich in biodiversity. For lunch you will be guests of the restaurant "Genziana", where Francesca and Maurizio pamper your palate with traditional products of this territory. In the afternoon we are lucky enough to have with us the Professor of History Massimiliano Olivotto, he will tell us the stories lived by the Passo San Boldo with words and images: stories of men, mountaineers and travelers. 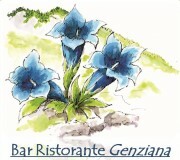 Meeting at 9.00 am in the Trichiana square or at 9:15 the parking lot of the restaurant "Genziana" in Passo San Boldo. Path for all, minimum altitude. 13.00 Lunch at the Restaurant "Genziana". Afternoon in the great hall of the restaurant between tales, images, stories and history. In the quiet of the San Boldo mountains, the Genziana Restaurant offers a comfortable atmosphere, traditional cuisine, the possibility to relax next to a large "Larin" (fireplace) . Near the restaurant there are several paths for short or long hikes. We organize walks with an expert to learn about the edible herbs in the area, or hike with naturalist guides. "The old road leading to the Passo from Tovena , has considerable historical significance. The original route dates back to Roman times and was flanked by watchtowers (they are the ruins of one, from the Byzantine period). He was instrumental in the connections between Treviso and Valbelluna: has been used for centuries by merchants, travelers and shepherds for the transhumance. During the nineteenth century are produced of requests and projects for the construction of a new path easier, but work began in 1914 under the direction of Ing. Giuseppe Carpenè. With the invasion that followed the defeat of Caporetto, the infrastructure was completed by the Austrian military genius for strategic needs; was something remarkable (for which he was critical local labor) as the work, which also saw the digging of five galleries, ended very quickly, hence the nickname "Road of 100 days." The returns of migrants and lack of seasonal work in the territories of the German and Austro-Hungarian Empire, caused also in the foothills of the Pre-alps an incredible influx of unemployed people. To resolve the problem, with the benefits of the decree of 22 September 1914 the Municipality of Cison managed to start the project of employment for 500 workers. Eng. Giuseppe Carpenè of Conegliano was commissioned to design a first section of the road from Tovena leading to Passo San Boldo, the project was approved by the City Council of Cison 14 November 1914 and the work began with the priority to occupy those who did not have a stable job . In front of the wall of rocks overhanging of S.Boldo", however, the works were blocked and the conclusion of the work was abandoned for problems of tactical and strategic ... but for the same reasons its completion was necessary to the Austro-Hungarians. The Austro-Hungarian command had a strategic need to communicate quickly and safely the valley of Belluno with the area of ​​Vittorio Veneto, the rear of the Grappa with the rear of the Piave. The Pioneers Austrians built in only 100 days (between February 1 and June 1, 1918) a daring road that unfolds in five turns overlapping in the gallery, a true masterpiece of engineering . This memorable work were also engaged, with a decent pay and a meal paid, civilian workers, young and old people, women, boys and girls. The road had a fundamental importance for the occupying army: it passed through part of the artillery engaged in the Battle of the Solstice and retreated en masse, four months later, the troops deployed in the Quartier del Piave, or contracted in a site without the possibility of escape. " This is in short the story of the road to the Genziana!